Das Gerät ist als Leerplatine, Bausatz und Fertiggerät lieferbar. Weitere Informationen am ATW Weiters in der Bedienungsanleitung, sie Link links im Navigarionsbereich. 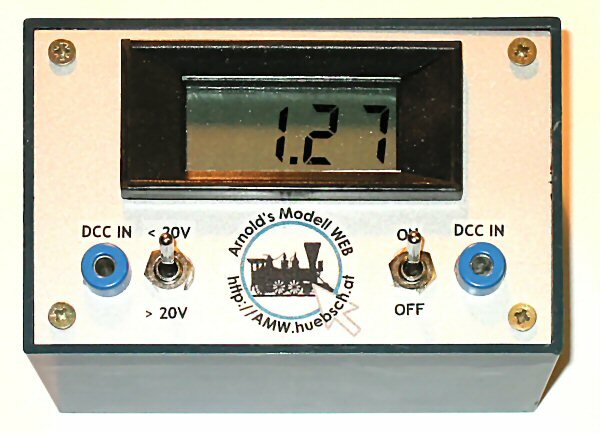 This track voltage meter displays the correct voltage on an digital powered layout. It addresses the problem, that convenital multimeters calculate wrong readings caused by the rectangular digital signal. The meter is available as blank PCB, kit and assembled meter. More info on my ATW or in the manual, see link in the navigation bar.